The Salawa Armoury blast still casts a long shadow over the lives of residents whose homes were damaged by the explosion with many still awaiting compensation such as a promised Rs 50,000 monthly rental allowance. They claim the committees appointed in 12 Grama Seva divisions affected by the blasts to look after the needs of victims are not attending to their needs and are not satisfied with the actions of government valuers. Some of these people have not been able to go to work because they feel compelled to be with their families for heath and security reasons. Some are unaware of the existence of the committees and their mandate for assistance. Each Committee comprised a Grama Nildhari of the division, a representative of the Police, Army officers, civilian representatives of both volunteers and affected residents, a development officer and disaster management officer. 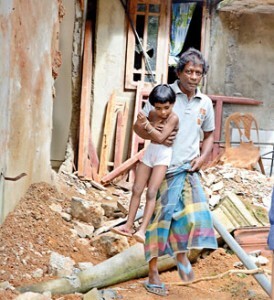 D. Piyathissa, 65, said his daughter had not been granted a rental allowance nor had valuation officers investigated the damage to her house even though the ground floor of her three-storeyed house had been wrecked by the blast, with fears the house could collapse due to the damage inflicted to its foundations. He said only three out of 286 families in the area had been given the allowance. The Sunday Times learns that residents in some areas refrained from taking free roofing sheets given by the military to speed up the resettlement process. K.G. Vipula Wijesiri, a mason, said that he had not been able to go to work since the day of the blast as, with the help of Air Force personnel, he had been mending the damage to his house, which sits 300m away from the base. He claimed he deserved to receive the allowance and alleged that some people who had not been affected by the blast were, through political influence, receiving the cash handout. Another resident, Chinthaka Lakmal, 45, also alleged members of the committees were manipulating the distribution of the allowance. Mr. Lakmal, a three-wheeler driver, said his livelihood had been affected by the explosion because he could not find enough hires to provide for his family. Local people were facing heavy expenses due to the catastrophe and were not able to afford three-wheeler transport, he said. A retired grama niladhari, P.K. Dhanapala, 77, who lives close to the Salawa base said two houses and two vehicles belonging to him and his son had suffered heavy damage caused by shrapnel from mortar shells and other ammunition, yet had not received an allowance or been given a satisfactory verdict by valuation officers. The current Grama Niladhari had told him to appeal to the District Secretary for the rental allowance. 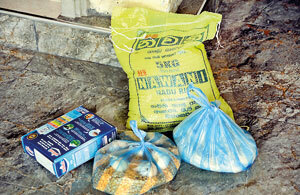 Mr. Dhanapala said his family had begun work on repairing their houses and expected this to cost about Rs. 10 million. The Finance Ministry has reportedly allocated Rs. 100 million to provide compensation for those harmed by the armoury explosion. P.K. Ratnasiri, a lorry driver from Pahala Kosgama, said his sister, the widow of a deceased army officer, had not been included on the list of people found to have been affected by the explosion and hence eligible for the allowance even though the walls of her house had been damaged and were unsafe. He said the committees were incompetent as they had failed to adequately convey public concerns to senior government officials, especially on health issues, since no authority had come to his area to check on the purity of the water in wells. He said many children from the area suffered from fever and diarrhoea, including his family, which had forced him to suspend his transport business in order to look after family needs. Tyronne Krishantha, a resident of Salawa, said that both children and elderly were suffering psychological trauma from the blast and became fearful at the sound of fireworks. He said cooperative centres had issued the weekly food ration for the money coupon worth Rs. 1,500, for a family of three, on Wednesday for the first time since the accident but that the rations were insufficient for a family to survive.Also, he added, cooperative officers intentionally avoided providing receipts when issuing the food ration and recipients were directed to sign a register before handing over the food ration. Rejecting claims of corruption and sluggish action by the committees, H.A. Pushpalatha, a schoolteacher and member of the Pahala Kosgama Grama Sevaka Division, said the committee had already provided the monthly rental allowance to more than 380 families in her division. 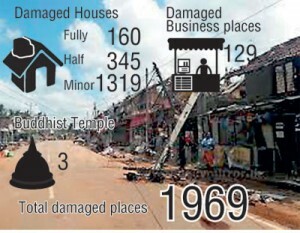 Army media spokesman Brigadier Jayanath Jayaweera said 1,080 houses had been cleared while 465 slightly damaged houses had been renovated and 70 more houses are still under construction. He said the affected region had been divided into five sectors, each handled by a brigadier to speed up the restoration process. He said that together with the Water Board, army personnel had purified water tanks and wells and gave assurances that there was no water contamination in the area damaged by the blast. The army had also distributed 1,350 stationery packs and uniforms to children in 20 schools, he added. Seethawaka Divisional Secretary M.M.S.K. Bandara Mapa explained that the Secretariat functioned as a coordination centre, linking the public in 12 Grama Sevaka divisions with the relevant authorities and the military to conduct relief operations and resettlement. He said the main responsibility of the Grama Sevaka committees, chaired by the Grama Niladhari of the area, was to report to the coordination centre on information they had gathered. The authorities used the information provided by the committees to resolve the problems of people affected by the explosion. Mr. Bandara Mapa said damage evaluation reports on 500 families will be out next week and compensation payouts would be made, beginning with those living at the heart of Salawa, which sustained the heaviest damage. He said compensation estimates for certain residents had exceeded Rs. 200 million so further negotiations will be conducted with such residents, who had received smaller amounts for their losses. 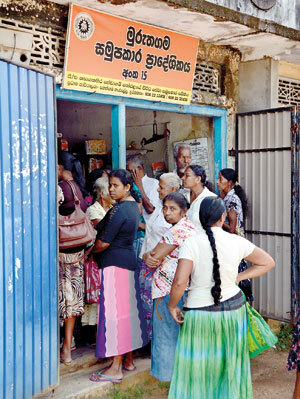 Although the monthly rental allowance was initially planned to be given out to residents with no sanitary facilities, no toilet facilities, residents with no shelter, business owners, houses with potential security issues and others, a decision was yet to be made on whether to grant it to everyone affected by the explosion, Mr. Bandara Mapa said. The Health Ministry is initiating long-term counselling sessions for traumatised residents, especially children, with mobile services planned.